For several years, my family and I have had the privilege of watching Anna’s hummingbirds feeding on a Shrimp plant in our back garden. 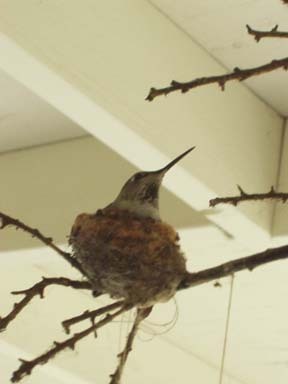 The most recent hummingbird visitor was very comfortable with us present just a few feet away. Occasionally it would hover a few inches in front of us. Last summer, I noticed what appeared to be a spider sac on one of our wind chimes. 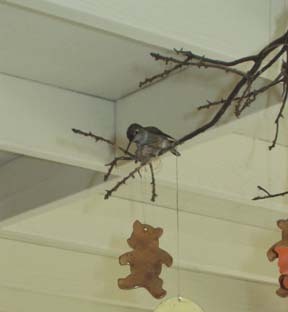 The wind chime is made of a manzanita branch from which hang ceramic cut-out animals. It hangs from the patio ceiling just outside the back door. I had planned to remove the spider sac, but didn’t get around to it. 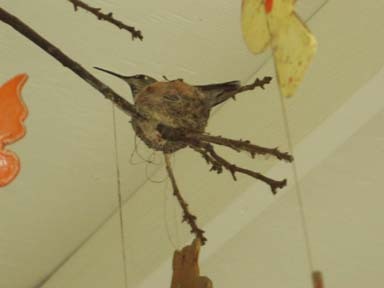 In January 2003, our hummingbird landed on the wind chime and began fashioning a nest. She added leaves and other debris. My daughter searched for information about hummingbirds on the Internet and we learned about their nesting habits. 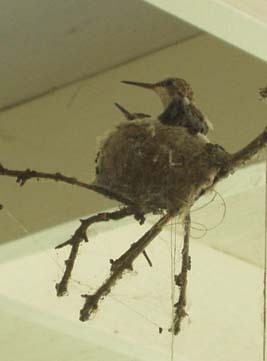 She also was responsible for photographing the female hummingbird and her nestlings. When the mother was absent from the nest and nighttime temperatures dipped to the low 40’s, we became concerned for the nestlings. My daughter looked in the telephone book for a Bird Rescue Clinic, just in case we were left with abandoned nestlings. It was such a joy to watch as the nestlings grew. We observed them as they practiced using their wings. They hovered only slightly above the nest. Each took their turn, and the more confident of the pair departed only a few days later, with the other following a day after it. 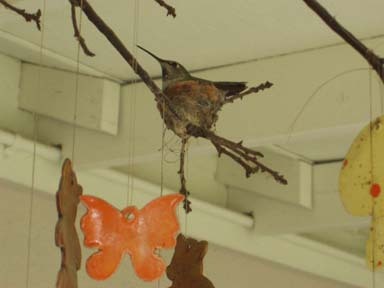 Recently, a young hummingbird landed on the wind chime and poked at the nest. Perhaps it was house-hunting for the future.